Satish Kumar has been a pilgrim ever since, at the age of eight, he joined the brotherhood of wandering Jain monks in his native India. Later he walked the length and breadth of India with Gandhi’s successor Vinoba Bhave, persuading landowners to donate a portion of their lands to the poor, and in the 1960s he made an 8,000-mile pilgrimage for peace, which included walking from India over the Himalayas to Paris via Moscow. In his new book Earth Pilgrim Satish draws on this personal experience and also his understanding of the spiritual traditions of both East and West. In Earth Pilgrim Satish draws on this personal experience and also his understanding of the spiritual traditions of both East and West. 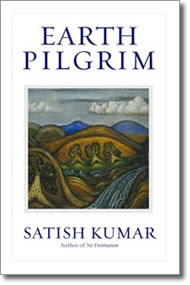 The book takes the form of conversations between Satish and others about the inner and outer aspects of pilgrimage: “To be a pilgrim is to be on a path of adventure, to move out of our comfort zones, to let go of our prejudices and preconditioning, to make strides towards the unknown.” If we want to tread the pilgrim’s path, we need to go beyond ideas of good and evil, and to be dedicated to our quest - to our natural calling. We need to shed not just our unnecessary material possessions but also our burdens of fear, anxiety, doubt and worry; in this way we can find spiritual renewal and enter on the great adventure into the unknown. Paradoxically, being on a pilgrimage doesn’t necessarily mean travelling from one place to another - it means a state of mind, a state of consciousness, a state of fearlessness. Satish believes that at this stage of human history we now need a new kind of pilgrim, unattached to any form of dogma - ‘Earth Pilgrims’ who are concerned with this world, not the next, and who are seeking a deep commitment to life in the here and now, upon this Earth, in this world. We need to realise that we are all connected, and through that connectivity we become pilgrims.